Justin Bieber got his hair cut. That sound? Beliebers celebrating all around the world. Specifically, the Biebs has had the sides and back of his head shaved. On Tuesday, the singer was spotted coming out the Nine Zero One salon in West Hollywood. Although Justin hid his hair with a hat and he held a brown towel over his head, pictures show the 21-year-old rocking what looks like a buzz cut on the sides. Whether the top of his hair met the same fate will be revealed when he shares that first post-haircut selfie. However, we don’t think the Canadian’s haircut will be as extreme as his pal, videographer Alfredo Flores, jokingly suggested in a photoshopped tweet last night. Justin himself gave fans a heads up about the imminent culling in an Instagram photo late Tuesday. The grainy pic showed one side of the singer’s head and blonde strands from his bleached transformation in December. 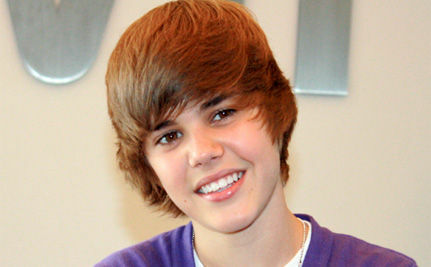 Throughout his career, the Biebs’ various hair styles have generated as much interest as his talent. 2009-2010’s swoop, 2011’s closer cut, the Believe Tour quiff. Last year, Stratford’s finest took the step of dying his locks platinum blonde. Despite many fans demanding that he cut his hair, the singer told Ryan Seacrest he was growing his hair out in an interview earlier this month. So why chop, and why now? Did Justin want to start fresh and get rid his unhealthy, over-processed blonde hair? Does he think he looks better with shaved hair? Did fans’ ongoing teasing get to him? More recently, during a trip home to his native Canada last week, the singer told fans, via a Shots photo caption, that a child had asked him whether he was a clown because of his hair. Manager Scooter Braun recently revealed in a Twitter Q&A that Justin (and likely, Skrillex and Diplo) will shoot a music video this month for their collaborative single “Where Are U Now.” If ever there was an incentive to get your hair sorted, a video that will likely receive millions of plays may be the best yet. After his haircut, Justin and a group of friend paid another visit to Disneyland Park at the resort in Anaheim, California. The grey hoodie-clad singer was spotted at the famed park on Monday with his younger step-sister, Jazmyn. Pictures show the Biebs’ newly shaved sides and back, and also revealed he took at least one amusement ride sitting next to a mystery lady, who may or may not be a pal. As ever, fans anxiously waiting for Justin’s revelatory selfie have taken to Twitter to share the usual mix of hilarious memes and messages. A selection follows below.